Each unhappy family is unhappy in its own way — and some are off-the-scale unhappy. At the end of Australian theatre director Simon Stone’s absorbing, menacing debut The Daughter, we have two such disintegrating families, their closets positively crammed with skeletons. Henry Neilson (Geoffrey Rush) runs a logging factory in a run-down New South Wales town, until he has to shut it down when contracts dry up. Amongst the offloaded workforce is Oliver Finch (Ewen Leslie), an optimistic, energetic but vulnerable family man whose ray of sunshine is his brainbox teenage daughter Hedvig (Odessa Young). Meanwhile in preparation for his father’s wedding to his housekeeper half his age, Henry’s son Christian (Paul Schneider) returns from America to his childhood home. There he rekindles his close friendship with Oliver but, as a recovering alcoholic, he’s estranged from his wife, and returning home only adds demons. This is the place his mother killed herself years before. Henry’s wealth is in stark contrast with the Finch’s, despite the fact that he was once in business with Oliver’s father Walter, played by a beaten-up looking Sam Neill. Luck went against Walter, as he spent prison time after taking the heat after a fraud case involving the two. Henry struggles to amend the relationship, but even as Walter wants nothing to do with him, the two families intertwine in inevitable and tragic ways. Miranda Otto has a small but central role as Hedvig’s mother Charlotte, who has her own inappropriate relationship with the Neilson clan. Christian believes, idealistically, that Oliver would be happier knowing the truth behind her secrets — “You don’t need to be scared of the truth,” he tells Charlotte. But events take hold that suggest sleeping dogs should most definitely lie. Stone adapts his own adaptation of Ibsen’s The Wild Duck that played to raves in Sydney, and later Oslo and London. His adaptation shortened and significantly updated the play, with which the film has a thematic link more than textual one. Stone calls the film “a memory film without flashbacks” in press notes, and like Ibsen, Stone is concerned with the realities of secrets and lies. But he’s more careful at revealing them, cooly measuring the script’s twists to slow-burn the revelations central to the plot. There’s not a trace of staginess to Stone’s direction, effortlessly assured as it is versatile. The film opens with a symbolic gunshot that disturbs the peace of this New South Wales backwater landscape and, photographed by cinematographer Andrew Commis in bleak grey hues, the rest is cloaked in an undercurrent of disturbance. The crisp 96-minute running time also helps to keep things claustrophobic. The acting is superb, headed by two Antipodean heavyweights in Rush and Neill, both in restrained less-is-more modes. 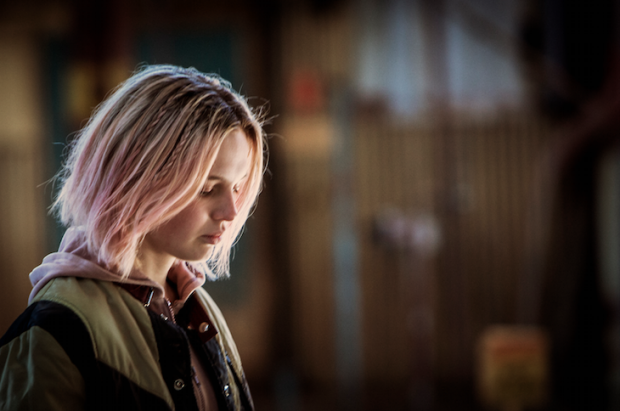 The 16-year-old Odessa Young, as the titular daughter Hedvig, is a passionate addition exploring a new-found sexuality and shooting cans with her boyfriend using her grandfather’s shotgun – one that has a role to play in forthcoming events. But she also cares for her own sanctuary of injured animals – a duck mending its wings proves a symbolic anchor — proving Young has a delicate nature that belies her outgoing, pink-haired features. This is also a breakout performance for Ewen Leslie, who starred in Stone’s original stage production. He symbolizes how Stone has made that rare leap from stage to screen that lacks evidence of adaptation. He’s devastating at showing the unravelling of the doggedly upbeat Oliver, cruelly subdued by past events as the film enters its final stages. To reveal more would be churlish. This is a thriller in which secrets hide behind the shadows like shot-gun wielding murderers. The Daughter screened at the Venice Film Festival and opens on January 27, 2017.